The Big South’s newest team finished just short on the road as Hampton fell to Marshall in the CIT semifinals. 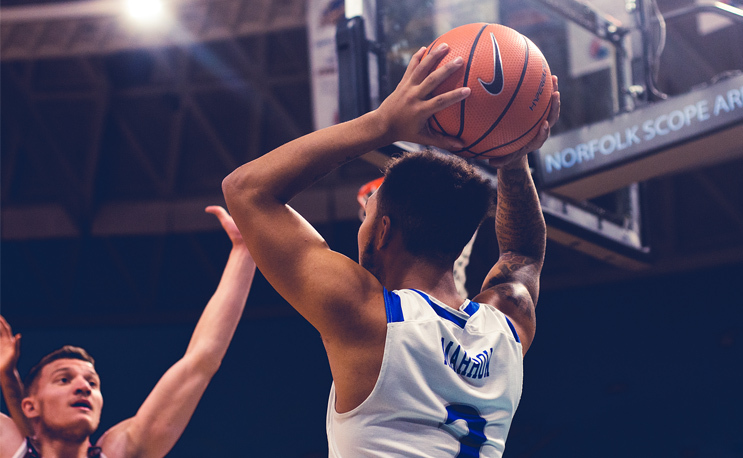 HUNTINGTON, WV – In a game that saw nine ties and 13 lead changes, Hampton’s second half rally fell short in an 80-78 loss to Marshall in the CollegeInsider.com Tournament Semifinals on Tuesday night. The Pirates held a 33-23 lead on a layup by Jermaine Marrow with 7:49 left. Marshall closed the half on a 28-5 run to take a 51-38 lead at half on a pair of Jon Elmore free throws as he scored the final five points of the half. In the second half, Hampton trailed 60-50 on a 3-pointer from Jon Elmore with 12:10 left. The Pirates went on a 15-4 run capped by a pair of Ben Stanley free throws with 7:39 remaining. Neither team held more than a two-point lead until C.J. Burks hit four free throws in a 25 second span to lead 80-76 with nine seconds remaining. A Kalin Fisher layup with two seconds left closed the scoring as Marshall got the ball in bounds and away from a Hampton foul attempt. Trevond Barnes topped Hampton with 18 points and eight rebounds to lead four in double figures. Fisher added 16 and four assists, Marrow had 15 points and Greg Heckstall added 14 and a career-best 15 rebounds. Marrow moved into second on the all-time Hampton University scoring list as he will enter his senior season with 1,987 points. He finished one point off the single season record held by Rick Mahorn as Marrow scored 854 points this season.